Even though only 0.25% of companies receive venture financing, venture capital is an important source of financing that result in an outsized impact on the economy. Some studies estimate that 50% of U.S. IPOs are VC-backed and that these companies account for 20% of the U.S. market capitalization and 44% of R&D spending. Although VCs fill a gap in the market by connecting entrepreneurs with good ideas but no money with investors, they are sometimes seen as a black box with little information on how they make decisions about their investments and portfolios. The authors of this paper wanted to answer these questions and they did so by surveying almost 900 VCs on multiple areas: deal sourcing, investment selection, valuation tools, deal structure, post-investment value add, exits, internal organization of the firms and relationships with limited partners. This summary will be focused on worldwide VC firms across stage (early/late) and on the information technology/software sector blended with the healthcare sector. Deal sourcing refers to the process by which VCs attract entrepreneurs and sort through those opportunities to make an investment decision. 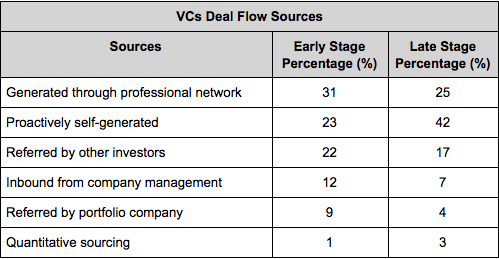 As we see in the table below, most of the deals come from the VCs’s networks. In the survey sample, the average firm screened 200 companies and only made four investments in a given year. Once a company is considered at the top of the funnel, the selection process usually looks like the graphic below. One interesting statistic is that late stage firms usually offer 50% more term sheets per closed deal, indicating greater competition and less proprietary deal flow. I expect this statistic to change as we continue to see the rise of Micro-VC and early stage fund raising larger amounts of money. When considering a deal, VCs will look at the attractiveness of the market, strategy, technology, product/service, customer adoption, competition, deal terms and the quality and experience of the management team. Late stage funds are more similar to private equity funds because they think valuation and business models are highly important. Given that early stage invests in companies that might not have monetized their offerings yet, it is not surprising to see that they rank the team and the product/technology as the most important factors. When looking at a team, VCs think that the most important qualities are, in order: ability, industry experience, passion, entrepreneurial experience, and teamwork. Given the rise of competition in VCs it is surprising to see valuation ranking so low, as something overpriced will most likely reduce cash-on-cash multiples. One interesting finding is that larger funds and more successful firms care more about valuation and product than their counterparts. This is consistent with the ability of high quality firms to win deals despite lower valuation term sheets. 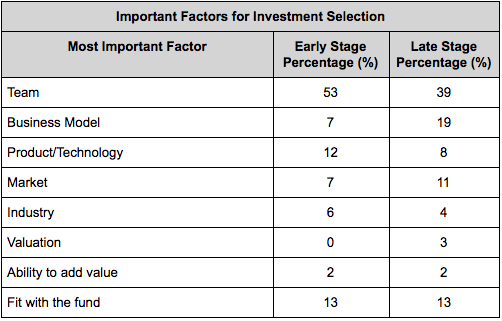 Finally, it is interesting to see how investment selection factors compare to successful investment factors. For early stage investments, the team has the most impact on success whereas the product/technology has less importance than when investors select the company. 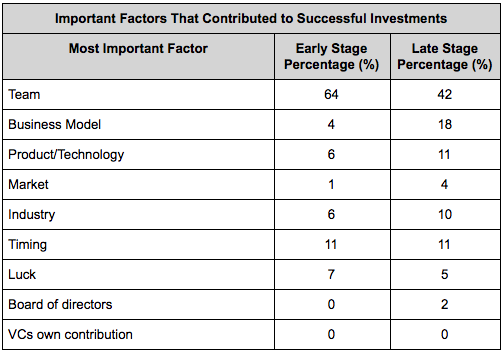 Interestingly, timing, luck and industry have a rather large impact on the success of investments. Give the uncertainty of most of their investments, it is not surprising that most VCs don’t really use financial techniques such as DCFs or NPV to evaluate their investments. Most commonly metrics used are cash-on-cash return, multiple of invested capital and net IRR. An other interesting finding is that fewer than 30% of companies meet projections. The survey found that 20% of VCs, 7% of late stage VCs and 31% of early stage VCs do not forecast cash flows when they make an investment. When they do they usually forecast on a 3 to 4 year period. Early stage VCs are more likely to set the valuation using investment amount and target ownership whereas late stage VCs can use more sophisticated methods to get to the company valuation. The intended goals of VCs contracts are to make sure that the entrepreneur does well if he/she performs well while providing VCs with leverage if the entrepreneur does not perform. VCs achieve these objectives through cash flow rights, control rights, liquidation rights and employment terms. Although California VC firms use more founder friendly terms, overall VCs are not very flexible on terms, particularly on control rights and liquidation rights (pro-rata rights, liquidation preference, anti-dilution protection, valuation, board control, and vesting). However, VCs are more flexible on option pool, participation rights, investment amount, redemption rights and cumulative dividends provision. An other important feature of VCs deal structure is syndication. 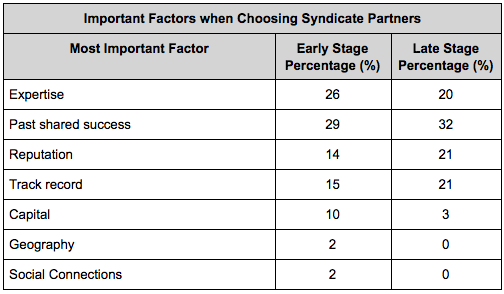 VCs syndicate around 65% of their investments in an attempt to share risks, build reputation, reduce capital constraints and gain complimentary expertise. VCs will choose along those factors when partnering with other VCs in deals. VCs are active investors and strive to add value to their companies after they invest. VCs are critical in the professionalization of startups: they will improve governance through strategic guidance, by structuring the boards of directors and by helping in hiring outside managers and directors. 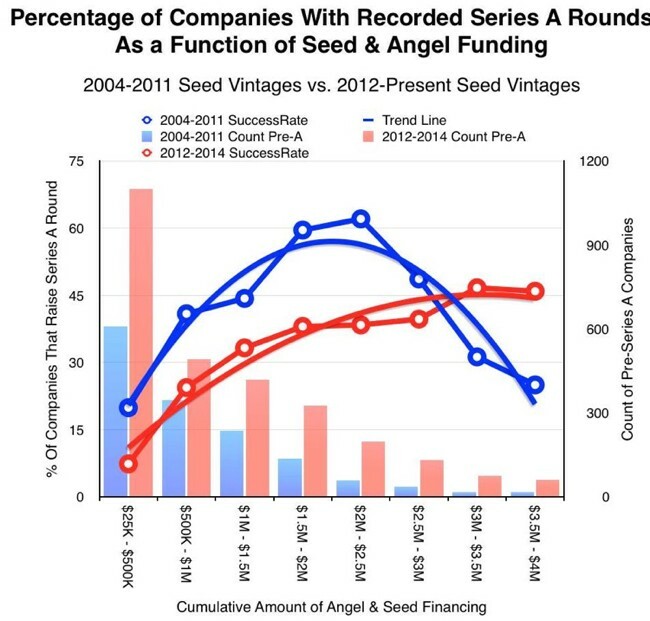 Unsurprisingly, given the “Series A Crunch” (see graph below from Mattermark), connecting to investors is more important for early stage than late stage investors. One interesting finding is that California VCs are more involved in helping companies find customers, which is critical for B2B companies, most likely because Silicon Valley work in a cluster environment that makes easier to connect people together. 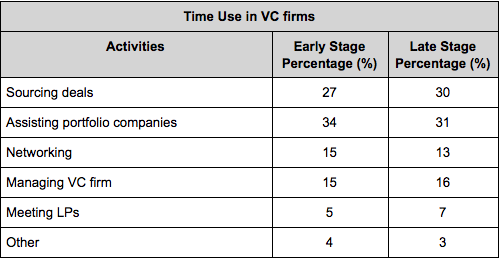 According to the survey, VC returns are driven by 60% deal sourcing/selection and 40% by value-added activities. The table below show the frequency of exits for VCs. It is important to note that most of the M&A events are disguised failures in the VC industry. 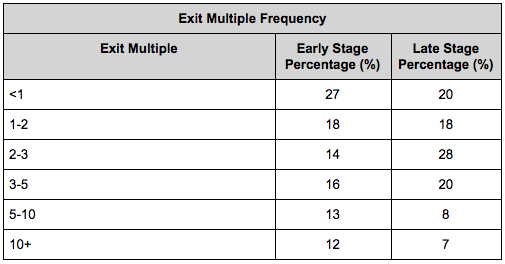 In terms of reported multiple for these exits, the mean reported multiple is 4.2 for early stage VCs and 3.5 for late stage VCs. Surprisingly, VCs report that the most important contributor to value creation is deal selection in front of deal flow and value add, although many VCs will market their proprietary deal flow and value add/founder friendly infrastructure. The average firm from the sample is small, with 14 employees and 5 senior investment professionals. 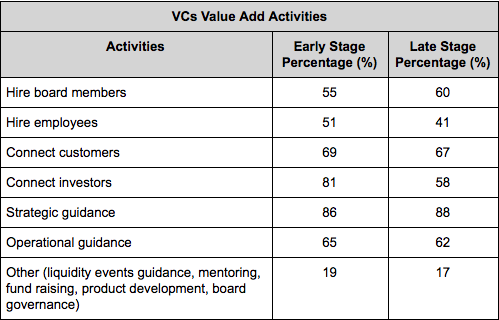 VCs typically spend their time on the following activities. Furthermore, in 60% of the funds, partners specialized in different tasks such as fund raising, deal making, sourcing deals and networking. 74% of VC firms compensate partners based on individual success. More successful and larger firms are less likely to allocate compensation based on success which highlight that VC is a team sport more than anything. 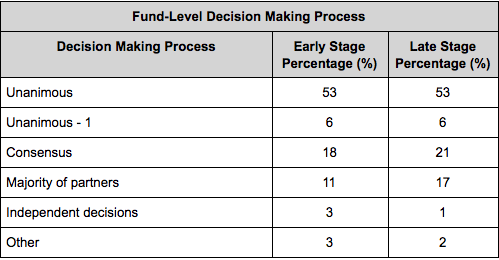 In terms of decision making for investments, firms use the rules highlighted in the table below. Data from Cambridge Associates show that over the long term, the private indexes continue to outperform public markets. 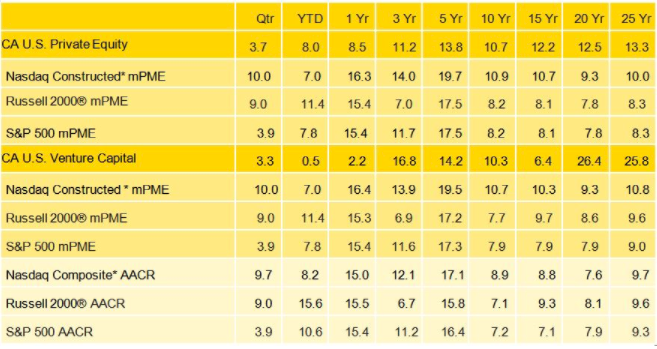 While there are still opportunities in the asset class, Cambridge Associates expect the relative outperformance to deteriorate because of the increase competition and the lack of liquidity market. What is surprising is that, given this deterioration and that fund performance tend to be persistent for the best funds, 93% of VCs still expected to beat the public markets on a relative basis. LPs need to be wary of this overconfidence in generating above market returns and most likely need to lower VC firms marketed multiples (early stage: 24% net IRR/ 3.8 cash-on-cash, late stage: 21% net IRR/2.8 cash-on-cash). As we saw in this post, although the VC world seems mysterious, it is not that special when we analyze it. With this post, VCs can benchmark their activities against other VCs and founders can try to understand better where they are at in the deal pipeline and what they can fix to increase their change of going through the pipeline. Here are some key points of the research. VCs devote substantial resources in time and human capital to deal sourcing, deal selection and value add. Deal selection is seen as the activity that creates the more value. When going through deal selection, VCs tend to place a greater importance to the management team, but business related factors (business model, market, product/technology) are also important. VCs do not use complicated financial forecasting techniques and will try to protect the financial uncertainty by using contract rights such as liquidation rights and control rights. The failure rate for startups is 38% for early stage and 21% for late stage, but most of the M&A exits are disguised failures. VCs try to reduce their failure rate by helping their portfolio companies on a range of activities from financing, to hiring, to connecting with potential customers.